Anyone lucky enough to have witnessed live cricket in India is, in my estimation, very fortunate. Having myself seen many Tests, ODIs and domestic cricket, I can safely say that some of these days have been amongst the most memorable of my life. A book, therefore, which charts some of India's finest Test wins is most welcome and S. Giridhar and V.J. Raghunath have lovingly and kindly re-enacted some of India's finest performances. It is disappointing these days to see fewer and fewer spectators at Tests in India, the preference being for the shorter version internationals and IPL which are filled to the rafters amid a cacophany of noise. A far cry from India's less heady days in the 60s and 70s - not always known for the same level of excitement seen more recently - when thousands would pack the stadia. India has, even during the days when wins were the exception rather than the norm, produced high quality players. The out-and-out fast bowlers usually came from Pakistan, the spin bowlers usually from India. India has produced some of the finest and graceful batsmen - people too - so the country is vast in cricketing history. S. Giridhar's and V.J. 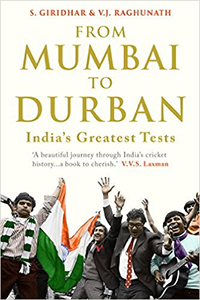 Ragunath's From Mumbai to Durban is, therefore, an invaluable and delightful book. The title may give us an indication of what to expect. Much has been made of India's, until recently, modest record overseas so this book chronicles, in the eyes of the authors, India's finest performances throughout her time as a Test nation at both home and overseas Tests. Albeit in a time of fewer Tests, it nonetheless took India almost nineteen years to win their first Test at Madras and their first overseas victory came at Dunedin in 1967-68, over thirty-five years after their debut. Unsurprisingly, few of the Tests selected in the book feature the early part of India's history but nonetheless it is nice to see a detailed history rather than one which concentrates on more recent matches. Every Test covered is written in great detail and will doubtless bring hours of pleasure to lovers and followers of Indian cricket. The use of rare photographs also makes this impressive book even more special. As the book celebrates India's greatest Tests, there are naturally a lot of wins mentioned but, in the earlier part of the book and therefore early years, some draws do make the cut. The famous Test wins - The Oval 1971, Calcutta 2001 and Adelaide 2003 - naturally accompany others which may not be quite as memorable but which were still fine performances. Many happy memories will be rekindled in From Mumbai to Durban. I would suggest that, for a book of this standard, the selling price in India of Rs799 is terrific value. I found it available on Amazon at greater cost in the U.K. but anyone fascinated or just interested in Indian cricket should try to buy it as it should give hours of pleasure.